Recently, while I was in the kitchen making dinner, I heard my two-and-a-half year old son running around the kitchen island counting by the 100’s to 1,000. My husband and I gave each other “the look” of shock, wondering who taught him that. After realizing that neither of us had taught him that we, simultaneously blurted out, “Brain Candy!”. We stumbled upon Brain Candy TV randomly one day when my son was fiddling with my phone and pulled it up himself on Amazon Prime. We rarely let him watch things on the phone, yet he has somehow mastered opening and operating Amazon Prime. Go figure! It turned out to be a fantastic discovery. He has learned more from this show than I would have ever thought to teach him at this age. While we, like most parents, try to limit TV time we are thrilled when our son asks for Brain Candy TV over some of the other mindless shows because of how much he learns when watching it. I was so overwhelmed with the impact this show has had on him, I reached out to the creator, Michael Moore, to thank him. Additionally, Michael graciously took some time out of his busy production schedule to answer some questions about Brain Candy TV for The Mom Report. For people unfamiliar with Brain Candy TV, how would you describe it? Brain Candy TV is an educational video series for kids aimed at inspiring an early love of learning so your children can grow up to be more confident and successful in school and in life. Featuring fun animated vehicles like dump trucks and monster trucks, as well as our cute dog Lizzy, we cover preschool topics such as ABCs, numbers, colors and shapes as well as more advanced topics like math and science. What inspired you to create Brain Candy TV? About five years ago I started doing volunteer work for an educational charity, which reignited my love of video production. Working with that charity also opened my eyes to some of the challenges faced in our educational system, and I wanted to provide a resource to get kids excited about learning from an early age. I hoped that if I could make learning fun at the preschool level, I could eventually inspire children to develop a thirst for knowledge that would continue on throughout school and the rest of their lives. What age group is your content geared towards? At this point, my videos are aimed primarily at the preschool range of around 18 months to 3 years old, but I'm in the process of slowly developing more advanced videos on basic math and science as my viewers grow out of my earlier videos, in addition to sprinkling in little lessons on sharing, empathy, and kindness. You know my family is a fan, what is some of the feedback you get from other parents? Some of the most encouraging feedback I get from parents are reports on how their children are learning by leaps and bounds from watching my videos, even at ages as young as 18 months. Even more amazing are the reports from parents of children with autism and various learning disabilities who say that my videos are the only content their children will watch, and how effective the videos are at helping them with their speech. I've also received very encouraging feedback from preschool teachers and certified speech therapists on the efficacy of my content. I also love the heart-warming stories of how some of my little viewers wake up every morning requesting "Brainiacs, Brainiacs," or walking around the house with their toy dog (that they've named Lizzy) to identify letters of the alphabet, or even dressing up as Lizzy for Halloween! What is it about your shows that helps kids learn and retain so much of your educational content? When I'm planning out the ideas for my videos, I'm always thinking "what would I have wanted to watch when I was a kid?" I remember loving cars and trucks, making ramps and crashing them into things...so I try to use elements like that in my videos to make them entertaining for my toddler viewers, while at the same time providing them with valuable educational content that gives them a jump-start on their early education. I also remember thinking that the most realistic toys were the coolest, so I put a lot of work into making the animation of the vehicles true-to-life with realistic driving dynamics and physics simulations for the dramatic crashes and action sequences. This can mean that a single video can take upwards of two months to produce, but I think it's worth it in the end if it keeps the kids engaged and helps them learn. 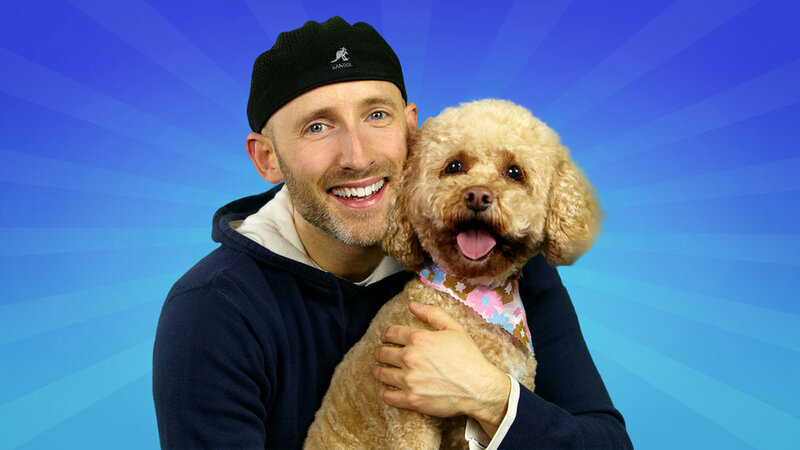 I'm not really the on-screen personality type, but I wanted to have some sort of character that the kids could enjoy, so I employed the talents of my little dog Lizzy to put a cute face on many of my videos, and I hope that she helps keep the kids engaged with the content as well. You have a multimedia background, how did you find a way to build fun and educational content that really resonates with kids? I went to college for multimedia design which provided me with the foundations for video production, but I hadn't really done anything in the field for over a decade when I started Brain Candy TV, so I had to re-learn a lot on my own. Luckily there are many great online resources for learning almost any software you'd like. I did a fair bit of research to figure out what sort of content was popular and why, and spent a lot of time learning about social media and search engine optimization, which was all new to me. But in the end I think it mostly comes down to putting your heart and soul into creating something to the best of your ability and having the passion to not give up, no matter how long it takes to achieve your dream. My ultimate goal would be to inspire and nurture a love of learning in children, and eventually to teach kids about the wonders of science and hopefully play a small role in improving the science literacy of the next generation. If, along the way, I can also encourage them to follow their dreams, be kinder to each other, and work together to make the world a better place, I think I will have achieved everything I could ever want. What are you currently working on that “Brainiacs” can to look forward to? I have a few series that I'll be continuing in the short term, such as my Mega Truck Alphabet series (letter E coming soon) as well as my vehicle assembly series, where I'd like to get a bit more detailed in explaining the engineering involved with how the vehicles work. I'm currently in the process of having all of my videos translated into Spanish, which is exciting. Hopefully these videos could be useful for teaching Spanish to English children as well. In the coming years, I'd also like to focus on getting kids excited about science and learning about how things work, exploring fascinating facts about the natural word from interesting members of the animal kingdom to big bang cosmology, as well as other areas in the STEM fields. There is a lot of fun educational content to come on Brain Candy TV and I can't wait to share it with all of my little viewers around the world! It’s clear that Michael pours his heart, soul, and creativity into every video he produces. If you are tired of the same ol’ shows in your house, I encourage you to give the highly mom-approved Brain Candy TV a try! Thanks again to Michael for taking the time to talk to The Mom Report. We appreciate his hard work and dedication to making learning fun for our little ones!